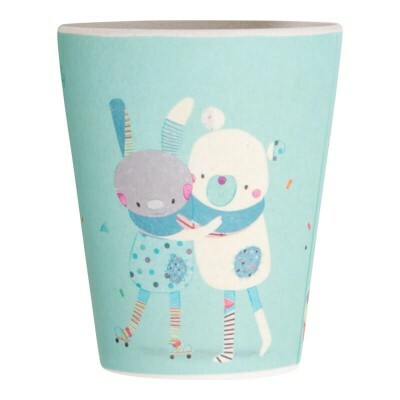 Blue tumbler made of lightweight bamboo, illustrated with the Jolis Trop Beaux rabbit and cream bear surrounded by confetti. Dimensions: 7,5x9,5 cm. Materials: 70% bamboo / wood fibres 30% melamine. Dishwasher safe. Not suitable for microwave cooking. Suitable from birth.